IDEAL FOR ALL TYPES OF WOOD DUST & WOOD CHIP EXTRACTORS. All sizes kept in stock for next day delivery. PLEASE CALL FOR LARGER QUANTITIES ! 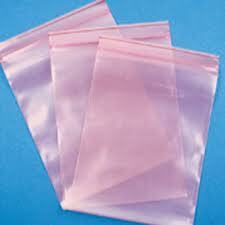 Pink 200G (50 micron) polythene with a grip seal opening, the resealable bags are ideal for items susceptible to static. The robust grip seal allows the bags to be sealed and resealed as desired and is a great way to group together or store components in a static controlled environment. Choose from 6 sizes, each in boxes of 1,000. High Tensile Butchers bags available in sizes 12"x18", 15"x20", 18"x24", 20"x30", 24"x36". Our high tensile clear bags / butchers bags come packed in 500's or 1000's and are block headed. Available in Light duty, medium duty or Heavy Duty. All stock lines of clear polythene bags are foodgrade and easy opening. Manufactured from strong clear polythene. Our Self Seal bags are ideal for collating a number of small items such as screws, nails or badges etc. The self seal bags ( resealable bags ) are also widely used for sending documents where a strong grip seal closure is required.